This is a telephone number. 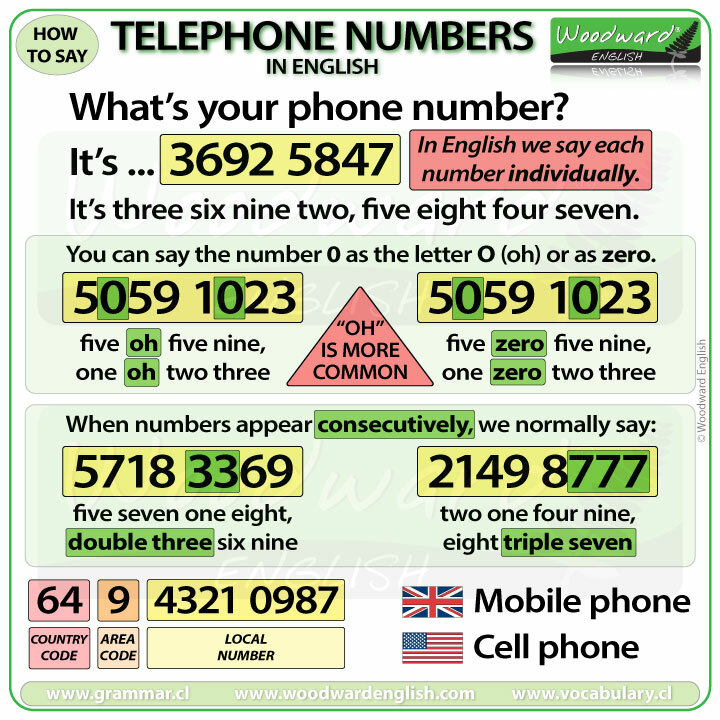 In spoken English we normally say phone number instead of telephone number. 3692-5847 = three six nine two, five eight four seven. The most common way is to pronounce the Zero like the name of the letter O (oh). 5059-1023 = five oh five nine, one oh two three. Sometimes in American English, the Zero is pronounced as Zero and not O. 5059-1023 = five zero five nine, one zero two three. However, you will also hear people say OH instead of Zero in American English. 5718-3369 = five seven one eight, double three, six, nine. 2149-8777 = two one four nine, eight triple seven. However in many movies or TV series, the phone number that appears starts with 555… and they say these numbers individually as five, five, five… and not triple five. This is a fake phone number so people don’t call them. 555-3527 = five, five, five, three five, two seven. How can you ask for someone’s telephone number? What’s your cell phone number? The first number is the country code. Sometimes it is one digit like the country code of the United States, which is 1, or the code for Russia which is 7. Sometimes it is two digits like the country code of New Zealand which is 64. Sometimes it is three digits like the country code of Ecuador which is 593. The area code identifies the town, region or specific area. For example, the area code of Auckland (NZ) is 9. The local number is normally 7 or 8 numbers long, depending on the country. Emergency services refers to when you need an ambulance, the fire brigade, or the police. The emergency services phone number is a three-digit number that varies from country to country. In the United Kingdom, you would call 999 in an emergency. For most countries in Europe it is: 112. For Australia it is 000. For New Zealand it is 111. What is the emergency phone in your country?